Twilight by Stephanie Meyer. I've finally worked out (to my satisfaction, your mileage may vary) why this series became so wildly popular, and why some people hate it so very bitterly. Promise, I'll write more on this some day. 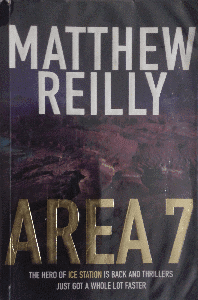 Area 7 and Scarecrow and the Army of Thieves by Matthew Reilly. I think I've written in more detail about Ice Station, the first book in the series, some time earlier, so not rehashing that. Area 7 is the second book, and Thieves is the fifth, so I haven't read the ones in between. Aussie writer M Reilly writes about an American soldier, Shane Schofield aka Scarecrow, who can give Rajnikanth pause, and run rings around Chuck Norris. His books are the equivalent of very fast-paced Hollywood action movies, complete with helpful italics and utterly improbable scenes in quick succession. Suspend disbelief, pack a tub of popcorn, and read breathlessly. It doesn't make sense, you have things like negative and positive magnets, and rusted aluminium tanks, but who cares? Some day M Reilly will grow up and become all thoughtful and plausible and then we'll all stop reading. 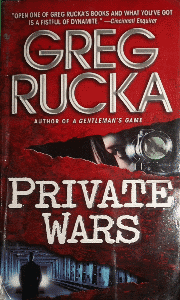 Private Wars by Greg Rucka. This features Tara Chace, Minder 1 in MI6. OK, here you thought the agents with licence to kill had 00 prefixes, and there are at least 7 of them. Wrong, there are three only. Tara Chace leaves MI6 to have a baby (clearly, I need to stop entering a series in the middle), and then is brought back in by her boss. Nothing is as it seems. Uzbekistan is being run by a dictator, and his ruthless daughter and her besotted chief of the secret police are bent on getting her the post next. Her brother is the hitch, being a sort of heir apparent, apparent only to the US Ambassador, who asks the Brits for help. Tara is sent in to get him out. Mayhem follows. Forget James Bond. Cut to the Chace. The Hearing by John D Lescroart. Lawyer Dismas Hardy (what kind of name that is becomes clear in this book) is begged by a friend to get her brother to hospital. He's a junkie, and the prime suspect in the murder of Elaine Wager (spoiler warning!) who is the chief detective, Abe Glitsky's unacknowledged daughter and a rising legal star. Abe has hinted to his staff to hang the mugger out to dry, hence the call. Dismas slowly becomes embroiled in the case, though Abe is his best friend, he admired Elaine, and hates his new client. 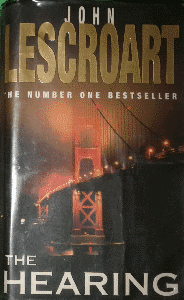 Vintage Lescroart. But read the series in order, okay. Illegal Action by Stella Rimington. This is what comes of writing without googling first. I have moaned in an earlier post that S Rimington wrote a wonderful first novel and would probably not write any more about Liz Carlyle. Serves me right (but, hey, I'm delighted). She's written five more. This is the third in the series (and I haven't read the second). Liz gets to protect a Russian emigre from an assassination attempt. Yup, the Russkies are as evil as ever. Or are they? I liked the first book more, but this one was good too. 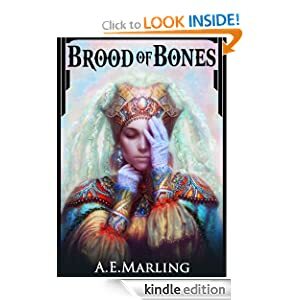 Brood of Bones by AE Marling. Amazon sent me a hint that this one was a free download for a time. Unfortunately, that means I cannot go out there and give it a five-star rating. Our heroine is the Elder Enchantress, and has won 27 gowns in academia, showing her prowess. For some reason, in a land of banyan trees and protectors named Gautam, she wears all of them at the same time, making movement tiring and complex. Which is the least of her problems, since she keeps falling asleep all the time. In this world, magic is done only when asleep, so her magic is fine, if only she can keep awake long enough to find out what the problem is she needs to fix. The great city of Morimound, from where she hails, has suddenly been afflicted with mysterious pregnancies. Every woman 12 or older is pregnant. Is it godly or an evil magic? Whom can she trust? Our heroine turns out not to be snobbish, incompetent, sociopathic or stupid, but a shy nerdy young woman you begin to love more and more as the book moves on through horrors and petty people to a rivetting end. Read this book! I look forward to more. 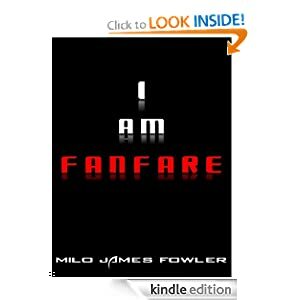 I am FanFare by Milo James Fowler. This is a short novel about a different kind of nerd. This one spends his life (if you call that a life!) on a social network. Curious about the ads it shows, he finds a horrible truth, with grievous consequences. Funny and a bit poignant. 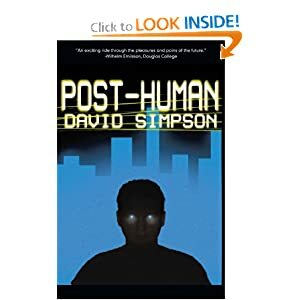 Post-Human by David Simpson. What I liked best about this book is the seamless way the post-human technology is introduced to us with the minimum of exposition. In the post-human society, nanobots or nans support humankind with everything from permanent online connectivity, to morning wake-up calls, trauma repair, IQ upgrades and work commutes to Venus. When James Keats, whose IQ of 200 is still above the international average, is working on terraforming Venus, his team suffers a problem and finds themselves offline. Navigating back to Earth by memory, they find every connected human on Earth dead. Now, all their hopes lie with the Purists. Somehow, they have to save the world. Very enjoyable (I'm on the sequel now). 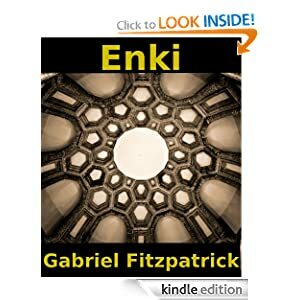 Enki is a short story I got from Amazon a couple of weeks ago, and finally read over the weekend in one sitting. There is a Librarian, defending (to the death) the books in the Library. It's a very science-fiction library, with all kinds of implied high tech. Lara Croft would feel at home--for a short while. When we come in, the Librarian is explaining to his newest visitor why the visitor is not going to get his book. It starts as a monologue, in chirpy modern style. It's funny. It's funny despite the fact that the Librarian is cruel, horrible, mean, despotic and makes your hair stand on end. A petty tyrant wielding his powers like a mini-God. He's every little kid's nightmare of a librarian, and has every little kid's dream of super powers if they were a librarian. He's Calvin in tyrannosaurus mode in the sandbox, with real people to crush and rend, except that he's a lot lot older than Calvin, and ought to know better. He's weird. I kept hoping the latest visitor would somehow escape the terror, and couldn't quite see how that was going to happen. No, I'm not telling you. You can read it for yourself. As one of the readers who reviewed this said on Amazon, Gabriel, could you try to write it all in first person from the Librarian's point of view? Anyway: TL;DR: This story grabs you like a flashflood and flows away with you. I liked it. I must be weird, too. (I'm linking to the Amazon picture because that's the one I have, it being an e-book, and also because I want to overload their server--mwahahaha--since they didn't let me review the book there, after so charmingly inviting me to do so by email. Cheapies). Spring 1868, and the Institute of Technology has been set up in Boston, which will eventually become the Massachusetts Institute of Technology. There are nineteen seniors who hope to graduate soon, and a Woman in the first year (who is hidden away in a basement and forbidden to interact with the male students; figures, they used to do things like that 150 years ago--for that matter, this is still done today in many places where they ought to know better). Marcus Mansfield, an ex-machinist who hopes to be a 'collegey', a dream which he still doesn't believe will come true, Robert Richards, who didn't quite get into Harvard like the rest of his family, and Edwin Hoyt, who actually joined Harvard and then left as the teaching was too ossified for his tastes, team up with Ellen Swallow (over time, over time, hello, it took till almost the middle of the book for this teaming up to happen) to solve the worst catastrophes the fast-growing city faces. It was these catastrophes which convinced me initially that this was steampunk (or maybe chemistry punk). First, ships run into each other in a fog, their compasses hopelessly fouled up. Then glass all down a street turns into vapour (yup, vapour, it melts, then vapourises, all at room temperature) and re-condenses. O-o-kay, that is not going to happen in real life, hence I conclude: fiction of the chempunk type. The Institute is barely tolerated by a public suspicious of science and terrified of technology (I love accidental alliteration--mwahahaha!) and the police is enjoined by citizens of repute to appeal to Harvard Professor Aggasiz, a determined opponent of Darwinism and a paleontologist whose principal method of scientific enquiry is to take all possible specimens, clean them and label them. And then do nothing else. Meanwhile in the Institute, the faculty, nervous that the Institute will be shut down because of association with the dread word Technology, passes a resolution that anyone investigating the catastrophes will be censured. Shortly after, Professor Rogers, the President of the Institute, is stricken by a stroke or heart attack, and moves out of the picture. While at it, we are introduced to Marcus' past as a machinist in the Hammond works (the chairman of which funds Marcus' studies along with his son's), where his almost-due graduation perks up his Civil War friend, Frank's desire to be a 'collegey' too. We are introduced to other characters, too, a maid with Prof Rogers, a teenaged gofer in a bank, a Pinkerton detective, a sensible police sergeant, and assorted alchemists aka chemists with private laboratories, union leaders and citizens (pretty much low-paid extras, these last). While our heroes are busy sneaking around, the evil genius strikes yet again, making buildings all over the city explode (I spare you the spoiler of how). Is the man with the terrible face a friend or a foe? We are also introduced to the sheer nobility of working with technology (sorry, Technology). Our friends labour in laboratories in the basement and deduce what has caused the problems by doing things like determining which chemical compound would disperse at that speed, and then checking it for glass-melting properties; by bouncing iron in a tub of water to see how it impacts compass movements; and detect what the villain concocted by prodding their memories of the materials they saw for fleeting seconds lying on a table. Sure, you can look at something and know at a glance that it was chloride of lime (wh--?). It's nothing short of magic, the way they work things out. And therein lies the problem with this book. 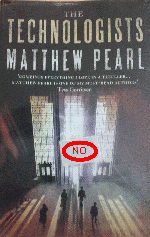 M Pearl claims in the afterword that his characters are based on real people in the Institute, including Ellen Swallow and Robert Richards, while other characters are amalgams of real people. He also, more preposterously, claims that the catastrophes described are also based on real incidents that occurred in those years. Yeah, right. A second year engineering student in the 1860s would certainly be capable of inventing a 'steam man' and a working submarine weighing 30 tons, all in his spare time on weekends. By touching a container of mysterious material and finding it cold to the touch, you can easily deduce that chloride of lime, heated (how hot and how long, too) and then powdered, and then having a couple of other chemicals added would result in instant freezing mix. And an invisible gas that is inert to brass can waft around and vapourise glass temporarily, just enough to trap people and/or chop them to bits. Well, how come we don't see this stuff around today if it is so real, then? It's almost as unbelievable as someone saving on clothes and spending it on exotic chemicals, which, combined judiciously, can produce almost anything you need, glass-vapourising things, galvanic cells, you name it. Ellen Swallow faces bias and bullying on a daily basis, the type which I have seen in fractional form drive people away from engineering colleges in real life, and withal is a strong and sensible person, on whom all these things have zero impact. She's probably from the planet Vulcan. Nothing else can explain her preternatural abilities. It would have been a decent chempunk novel, but for this exaggerated claim of foundational fact, and characters so exaggerated that they are caricatures or stereotypes. I cannot bear not telling you about 'reversing electric current' so that the explosion occurs at the other end of the city--even if it's a spoiler. This is just .... aargh, spare me! stuff. There's a writer who knows zero about electricity for you. So what is this? It's a story of magic, apprentice wizards and all, placed in the 1860s, painted hurriedly and with the cardboard below showing through, with pulp-fiction-grade 'Technology'. Many a Hollywood movie has used these tropes (weren't there several recent ones with burning trains headed into cities? ), but there, special effects and fast action convince you to suspend disbelief for a few hours. Alas, my disbelief is running around screaming and ranting and pushing out of its way in peevish fashion any praise for characterisation or twists in the tale. No, no, a thousand times no, it cries. Now, if you say it's a chempunk novel, then it's an okay read in a predictable enough fashion, suitable for impressionable mid-teens. Just don't expect those teens to become engineers later in life, though. Don't you hate it when you pick up a book from a genre you don't normally read, open the first page (what were you thinking? couldn't you just stop at the back cover, idiot?) and then you can't let go because the book has grabbed your eyeballs and found a sneaky way into your brain? Yeah, neither do I. :) It's such a delight to find a book that grabs you on page one, and lets you off gently 336 pages later, with your head just that little bit expanded while at it. 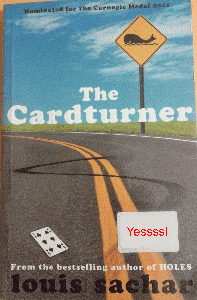 So, grab this book if you want to read a story about a teenager and his granduncle, or you want to learn about the card game bridge, or how a generation gap can be, ahem ahem, bridged. Or even if you don't want to learn about bridge (he marks the sections you can skip if you want just the story, but it's no hardship to go through them). Alton Richards' parents want him to drive 'your favourite Uncle Lester' to and from his bridge tournaments, now that he cannot see any more and cannot drive himself. Uncle Lester's favouriteness is due entirely to his exceeding richness and paucity of wife or kids. Of course, you know that Alton will get to like his Uncle for himself, and vice versa. Ha ha, maybe not. Anyway, Alton is roped in as a cardturner. What's that? His job is to turn over onto the table the card his uncle tells him to. He is ideally suited to this critical but dumb as a pillar job, as he doesn't know the b of bridge. So how come Trapp, as he starts calling his Uncle, doesn't want his other helper, his grandniece Toni, around any more? Because she asked him 'Are you sure?' and thereby leaked his hand to the competitors. Aargh, the horror! Serves her right. But wait, she's now back as his partner? Alton's mother, in the obvious and horrid style of adults everywhere, brightly talks her into admitting schizophrenia. Ouch. Alton feels that's not fair. Moms. Roll of eyes here. Wait, why am I on the side of the teenager, here, instead of the parents? Anyway, Alton's parents are really getting desperate. And Alton is learning bridge instead of badgering his Uncle. Stupid teen, why can they never do as they are told? That's more parental, whew. Yeah, sounds forced, doesn't it? There is a fascinating backstory which comes out slowly, as slowly as you get to know and like Alton. Plus a twist in the tale towards the end. What can I say? It grabbed me on page one. I totally blame the book for assault and battery. The worst of it? I might start playing bridge. Help! Mummmmmmeeeeeeee! OK, this one is going to be fast, as I've got to write three more (what a nice problem to have!). I'll write about Horizon by Lois McMaster Bujold later this week. 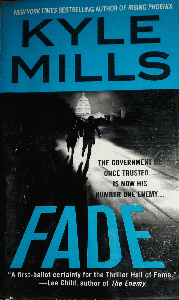 Fade by Kyle Mills is about an ex-Navy SEAL (USA) named Salam Al Fayed. He was named Fade because he could fade into the background, and because nobody in the rest of the team wanted their back to be had by someone named Al Fayed. Somewhere early in the book we get to know that Al Fayed is a second-generation American of Christian Arab parents. That made me wonder if a Muslim Arab in the same situation would not have become a SEAL, or whether some marketing person said the novel wouldn't fly in the market. Okay, okay, you want to know what happened to Fade. Fade did all kinds of assassination missions for the CIA, until he was finally shot in the back. The bullet lodged near his spine. His best friend, Matt Egan, tried to get him some experimental surgery, which the bureaucracy couldn't process. Bitter, Fade worked for some Columbian drug barons as an enforcer, to get the money to pay for the operation, but by the time the bullet was inoperable. In terror of falling down dead any day, he starts making furniture (of all things) for a living. Until Matt's new boss in Homeland Security (CIA not happy with Matt, so he has to move) decides to form a new crack team, and decides Fade can be induced to join up by getting threatened with jail time for the drug stuff. Voila: an anonymous tip to the police. Enter Karen Manning, a SWAT team leader whose boss is convinced that a woman in that position is a big mistake and seems to dedicate his life to running her out or running her down, whichever works when he gets up in the morning. Karen's team hits Fade's house to arrest him, and he thinks Homeland Security is there to kill him. Uh oh. Now Fade is on the run, hunted by all, Karen is thrown to the media wolves, well muzzled herself, and Matt and Hillel Strand (the boss) are on Fade's shortlist of people whose lives he must shorten immediately. Karen is trying to protect her reputation, Matt his family, and Hillel his career. Fade is just trying to kill Matt and Strand and then himself. So they now all try to do the right thing by their own lights, and very different lights these are. The bad guys get their comeuppance, is all I'm going to say, since you expect that. As to the good guys, they get different kinds of resolution each. Oh, wait there is At Risk to tell you about, too. I promised terrorists from different angles, didn't I? Stella Rimington's qualifications to tell this story are that she used to be M, the head of MI5. Okay, she was never called M, but the James Bond on-screen boss became a woman around the time Dame Stella became head of MI5 (I'm not 100% sure she is a Dame, but hey, artistic license, and you can google, too, if you try). So that means that you won't get any really stupid bloopers, the type that have real agents rolling on the floor, laughing their heads off. There are different terrorists, here, not the fake ones of Fade where venal careerists manipulate who gets called a terrorist. The ones in At Risk include a Pakistani-trained import into the UK, and a home grown 'invisible'. Clues creep in to indicate something big is going down. The forces of law and order get unexpected help from a greedy people-runner who thinks the new illegal immigrant can be easily robbed. His lesson otherwise lasts only a millisecond. Now the police are after our friend the terrorist. And the 'invisible' woman. And I always thought you couldn't have a truly silenced gun. Live and learn. Of course that's not a spoiler! Bah, you can read the back cover. Now, Liz Carlyle of MI5 and her surprisingly supportive boss (most such books have the protagonist trying to outsmart their boss as well) are trying to track down the villains. Yet the villains are smart, too. And committed. The 'invisible', who grew up a rebellious teen from a broken home, finds her true faith in Islam, converts, and then concludes the world is too bad and needs improvement. OK, she's a Pakistan-trained terrorist, too. (Oh, come on, less of the 'spoiler' howls, this is less than a quarter of the way through the book., and it's not like I told you her name and you went and checked her facebook profile. Sheesh). Step by step, all the people involved go down the paths of their own choices and the destinies they thereby choose. Liz is 'assisted' by a flashy MI6 compatriot, Bruno Mackay, who fancies himself a romantic seducer, and completely rubs her the wrong way in many head-shaking ways. And of course, as you might expect, they all conclude the terrorists will attack the wrong target. Last minute breakthroughs mean that England continues to be safe. Yay and all that. This book is different from most thrillers. There's no shortage of the usual stuff: characterisation, building up motives, and the most obvious of villains (Islamic terrorists have completely supplanted communist Russians). Yet, the story has a steady, relentless pace--no terrific suspense scenes, just a systematic unfolding of the uncovering of the plot. It's not breathless, yet it's not leisurely. You feel for the characters, all of them, even the terrorists. Yet black is never whitened and white is not black. It's got several tropes in it, yet is more than the tropes. Yes, it could happen this way. It may well have, in many ways. The novel has a real presence that most writers cannot manage. Maybe Frederick Forsyth, but maybe not even him. I don't think S Rimington will write a whole lot of other novels. She's not a professional novelist, after all. And that's a real shame. I'd read more about Liz Carlyle any day. Or any other agent. TL;DR: Fade has the better dialogues, and the appallingly cynical look at reality that comes with such a person's background. It has friends, and good guys and bad guys. At Risk lets you feel the mud and sea spray, and you know it could well happen this way in real life. You get not the whole persons, but the slice of their life when this event happened. And the bad guys lose and all questions are answered. What more do you want? Robert L Forward had multiple degrees, some of them at doctorate levels. In engineering. And several patents. So, you can guess he was really, really smart. Larry Niven and Jerry Pournelle used to visit his lab so that they could cadge cool new ideas for their latest books--there's a Forward mass detector in Niven's Hole Man, for example (that's actually real technology). So, wouldn't it be so much better to read the man's science-fictionish ideas direct? I actually approached the concept with some trepidation--not everyone can write a great story, even with mind-bending physics as a supporting character. So, I started off small, with Indistinguishable from Magic, which is mainly a collection of essays, with the occasional short story. Hmm, I said to myself, the stories are relentlessly upbeat. How much of that can I take? Can I really read a whole book with no villains, no evil human impulses? How will the story progress without the spice? Turns out, I can take a good solid chunk of it! Which brings me to Dragon's Egg. Dr Forward (the books are sold without the 'Dr', which seems disrespectful of his achievements to me) has written a book about extraterrestrials. Indeed, they don't live on a rocky planet. Heck, they don't live on a planet, they live on a star. A teeeeny little star. Really teeny, only 20 km across, and with a ferocious gravity gradient. Not to mention the magnetic field. OK, backing up a bit. An astronomer graduate assistant discovers a neutron star doing a close sweep past the solar system. Her son grows up completely irritated that Mom's discovery was credited to her advisor, and becomes not only an expert on neutron star physics, but also a science writer of renown. Therefore, when it is decided to send a manned scientific mission to the star, the young Niven (hee hee, you spotted that, too, did you?) is the natural choice to lead the mission. In parallel, we witness the rise of a new species on the neutron star. Dr Forward gives a hat-tip to Hal Clement in the appendix where he describes the species, saying that in all other respects than specifically mentioned, the species' reactions are like those of Clement's ETs in A Mission of Gravity. Except that here, we meet the females of the species, too, it being a more egalitarian society than the one on Mesklin. Clement just wrote boys books for a long time before expanding scope to include girls, too. Forward, whose wife is described in the 'About the Author' page as 'contumacious', clearly did not believe a woman's place is in the kitchen, and had succeeded once in driving a less sensible editor crazy with stories featuring a woman asteroid hunter. By the time the humans reach the star, the aliens have progressed to mathematics, religion (for a short while) and temple building. The building is awesome enough for the humans to spot it from orbit. So they contact the aliens. Noooo, that's not the charm of this book. The charm is in the physics and engineering. Think about it. How do you get humans within 400 km of a neutron star? The answer features antimatter, but in a literally throw-away fashion. Keep thinking. Dr Forward called this book a 'textbook on neutron star physics disguised as a novel'. The publisher's blurbs include praise from scientists, science fiction writers, and one reviewer in a regular science-fiction-reviewer mode. The problem is, the rest of his novels are not available in India, not even in second hand shops. Wail. This book was published so long ago that it didn't have blurbs on the back cover! (I must take a picture of the cover art and put it here, but, apologies, not today). It does have a tagline below the book name: The greatest fantasy novel since Dune. Two interesting personal observations about when I first read this book. One, I hadn't yet read Dune, which meant that that more-famous book now had to compete against The Pastel City as a benchmark. Two, it was a gift, which became embarrassing within 45 minutes of my getting it. The embarrassing part about the gift was that I read the book in about 70% of the time the gift-giver took to choose the book for me. In 45 minutes, I was challenged for reading the back of the book first, and reluctantly confessed to having almost finished the book. That was a lie. I'd already finished it within 35 minutes, and was on my first re-read. The Pastel City can fit either classification, science fiction or fantasy. Since I'm reasonably certain most people have not read this slim gem, I'm giving a slightly more elaborate summary here, with fewer worries about spoilers. The Afternoon Cultures, having exhausted the earth and most of space, die out after an unspecified number of millenniums. The remnant fallen men of the south, ruled by the men of the north, rebel, and establish the city and empire called Viriconium. Their technology is salvaged from the Rust Deserts, as is their metal. Unfathomable technology is beaten into blunt use in barbaric fashion. King Methven of Viriconium gathered, before the action starts, a group around him who had special talents, like Lord tegeus-Cromis, who 'fancied himself a better poet than swordsman', Norvin Trinor the strategist, Benedict Paucemanly who took a crystal launch and perhaps attempted a moon-landing, and others. He also married his brother to the Queen of the northmen. His niece, the Moidart, grew up scheming for his empire, and when the book starts, is attacking Methvet Nian, 'known in her youth as Jane' and her followers in Viriconium. All this in the prologue itself. tegeus-Cromis, the introverted Lord, joins other Methven coming belatedly to aid their Queen: Birkin Grif, Tomb the Dwarf (who studied with Paucemanly), and old and dirtily old Theomerys Glyn. Looking for Trinor, Cromis finds Norvin has abandoned his wife in penury. He gets authorisation from the Queen and rides north (on horses, ahem) to take over the army and hope to defeat the northmen. As he races to catch up to Grif and the others who have gone on ahead, he is accosted by a metal vulture which insists he needs to immediately abandon all and go to a mysterious Cellur, aka the Birdman. Cellur warns of dire tidings, worse than a mere battle or a mere empire: Fear, he says, the geteit chemosit. Pushing through psychedelic marshes, Grif's group of smugglers and Methven is attacked by a tall being with three red eyes, untiring, and armed with a force blade. Cromis beats it off, at the cost of his own small force blade, his unnamed sword, and his peace of mind. The monster has stolen the brain of the sentry, and Cromis has lost his authorisation in the swamp. The bureaucrat in charge of the army refuses to recognise the group, and also ignores all useful intelligence. When the Moidart's army attacks, they don't expect the attack. Also with the army is a long line of black automatons, which she 'has dug up somewhere'. They butcher Methvet's army. Cromis, fighting, meets her general. Trinor has turned coat, but Cromis cannot kill an old friend. Cromis and some of the survivors are rescued by Methvet herself, fleeing the fall of Viriconium. Cromis seeks out Cellur, who explains that the automatons harvest brains, and once they run out of enemies of the Moidart, will turn on her army and the populace. His mechanical birds transmit scenes of just such chaos. He trains Tomb to turn the brain-harvestors off, and explains where to find the control room. Cellur himself is older than his own memories, which are ancient, and probably dies protecting their retreat when they are attacked by chemosit under the Moidart's men, armed with force cannons and crystal launches. Looking for the correct location, they are overtaken by Trinor, himself desperate to turn the geteit chemosit off. More deaths occur. Introversion is shown to be problematic (this was the 70s, okay). Right. The empire is saved, but I'll leave the rest of the details for those who can still find copies of this little 180 page gem of fantasy/sci-fi. The setting evokes both old Britain, as well as the psychedelic 70s when we all expected to see the end of the world--any day now--and technology was getting to be as advanced as magic. The writing is spare and crisp. The characters are well delineated, and the story progression inexorable yet unexpected. And then, a few years ago, I came across another book by M John Harrison, called Viriconium Nights, which I promptly wasted money on. Harrison explores in this fat tome, alternate worlds of Viriconium. Alas, while hip and post-modern lit and all that, all four versions are depressing and do not measure up to the original. tegeus-Cromis appears in all four alternates, in roles not that of a hero, but ranging from patsy to villain, and Queen Jane morphs into a monstrous creature called Mammy Vooley. I have never reread this book, and will probably never do so, so bear with me as these memories are more than a decade old. Transplanting tegeus-Cromis into 1970s Britain was at best an exercise in horribleness. It's like graffiti executed furtively at midnight in stinking subway tunnels, in a bitter and sad parody of a great oil painting. Or like the worst alley scenes in the movie The Matrix crossed with black and white and red all over Kill Bill part 2, watched at night while bombs and rockets rain plaster around you and the voltage flickers. Or like a bad Stephen King book (not a good one). As highly as I recommend The Pastel City, is exactly as lowly as I warn you off Viriconium Nights. It's almost as if they were written by two different people: the first by an optimistic and brilliant talent, and the second by a cynical and jaded also-ran academic with literary pretensions, bloated with fading fame and oodles of disrespect, attempting something clever based on something diamond-bright, but burying it in dirt instead. Sigh. How art the mighty fallen. About a month ago, I found that rarest of objects: a book lying in my house, which I hadn't yet read. I'd bought this in a sale, along with a bunch of others, and then rearranged my bookshelf, and other assorted chaos, which meant it went unread. And then I thought to myself, why on earth did I buy a book by Michael Crichton? Frankly, I think the first book he wrote was the best. And if you've read The Andromeda Strain and know how clunky the writing was, you'll wonder if I'm nuts. Naah, I shall explain by the by. Anyway, I read the Introduction carefully, and with a sense of unease. Was M Crichton writing about an actual expedition? But when we reached the bit about the chatty ape, I drew a sigh of relief. Fiction, after all. Thank goodness for three decades of science between then and now. This book was published in 1980, and is putatively about an expedition into the jungles of the Congo, to discover blue (boron-doped) diamonds, natural semiconductors. For unreal reasons, the government there has decided to award all the mineral exploration rights to the first conglomerate that finds the minerals. In today's day, that would be called a Crony Capitalism Scam, and I find it only barely plausible that people in the 80s were stupider than we are now in these matters. Of course, Africans were assumed by Americans then to be fairly stupid and/or corrupt, very Dark Continent and all, despite new democracies, which were there only to be subverted, right. The Japanese were the competitive villains by then, having edged out the Russians, and not yet been replaced by the Chinese. Ahem, less of the 20-20 hindsight, right? I'll pull out a sample of M Crichton's predictions soon enough--it's eerie to see what he got right and what he got wrong, but you have to admit his research was cutting-edge, even if he picked and chose. Anyhow, the first expedition in gets killed. A second expedition goes in, while pretending to be the first, so enters sneakily. With a gorilla in tow, who has the world's biggest sign language vocabulary (for an ape), and who is expected to interpret for the humans with grey gorilla-like animals who've been spotted on the last video transmission from expedition 1. This was normal to expect in the early 80s, ok, don't laugh. Any day then, we had expected to talk to dolphins. Anyhow, the company, ERTS, does work for clients, and is looking for a natural source of boron-doped diamond to make optical computers with. The expedition had found a ruined city near the diamonds, which the researchers in the USA feel could be the Lost City of Zinj, famed for its diamonds. Amy the ape, in the meantime, has been having dreams, duly reported via crayon drawings, which, with cries of discovery, are found to be exactly the same as old stories of the city. [Gaah moment]. And the city is discovered easily since it has new forest near it instead of old old growth, which shows an albedo difference of 0.03 on a scan of satellite data. So simple. Karen Ross, in her twenties, and a mathematical prodigy, heads expedition 2. She has the help of Peter Elliot, who is the trainer of the gorilla Amy, and Capt Munro, who specialises in backdoor entries into African countries where the opposite party has bribed the government into preventing the ERTS guys from entering, and ERTS hasn't managed the counter-bribery with quite the same finesse. In 1977, IBM announced it was designing an ultra-high-speed computer the size of a grapefruit, chilled with liquid nitrogen. The superconducting computer required a radical new technology, and a new range of low temperature conducting materials. ... Experts anticipated that by 1990 there would actually be one billion computers--most of them linked by communication networks to other computers. Such networks didn't exist, and might even be theoretically impossible (A 1975 study by the Hanover Institute concluded there was insufficient metal in the earth's crust to construct the necessary computer transmission lines.) ... The 1980s would be characterised by a critical shortage of computer data transmission systems... Within ten years, electricity itself would become obsolete. The client wants an edge for the next 5 years -- "in an industry where competitive edges were measured in months". But Ross is the typical Crichton novel woman -- with huge negative traits. YOUTHFUL-RUTHLESS/ TENUOUS HUMAN RAPPORT/ DOMINEERING/ INTELLECTUALLY ARROGANT/ INSENSITIVE / DRIVEN TO SUCCEED AT ANY COST / ... DESIRE FOR SUCCESS MAY PROVOKE DANGEROUSLY ILLOGICAL RESPONSES. Crichton's novels would have you believe that corporations and scientists have no conscience, and no common sense either. The tech is high, indistinguishable-from-magic high--some of it I have yet to see in real life, or even in movies. Company drones hop to execute, and never think for themselves. Change happens only when someone is killed, usually by intent. Is that what American companies are like? Occupy Wall Street by all means, then! The tech, oh, the lovely tech: A portable camp has this: a low-throbbing electrified fence, the sentries armed with LATRAPs aka "laser-tracking projectiles, multiple LGSDs attached to sequential RFSDs." In English? The sentries had lasers to home onto the target, and tripod-mounted "marlan-baffle silencer" equipped automatic guns would do the rest, panning and homing and blasting with elan. Not to mention swallowed tracking devices that don't get (ahem) eliminated, mylar tents from NASA tech that fold down into hand-sized packages, teeny satellite receivers, lasers that can pinpoint the city over long kilometers, and many other wonders. Still, they have to walk in. Nature for you. A lot of Lara Croft the tomb raider may have come from this book. There is the hidden lost city, with weird architecture, its history carved into rock glyphs (a trope that was rapidly old after HP Lovecraft), mysterious dream visions, high-tech decoding (radar reads below the moss and gets processed and sent back via satellite), evil opposing parties (not that with Karen Ross you have an empathetic character), high tech gadgetry, data hacking, honey trap computers, the lot. You even have a guy who can write a program to distinguish gorillas from other apes with 3 seconds of tape. And he does this practically overnight, and as a bonus, decodes the sounds and pronounces them to be language. But he needs a few more samples to translate. Shame on Google, then, their machine translation is still so bloody clunky in 2012. What are all their PhDs doing anyway, if they can't even handle human-to-human languages, eh? All programmers will be allowed a few minutes at this point to go bang their heads. Hee hee hee. Enough with 20-20 hindsight, I'd say, except that Hollywood movies still 'code' this way. Usually with cool graphics, too. I haven't changed my mind about the misogynistic undercurrents in Crichton's books. Karen Ross destroys much, and then seems strangely bewildered by it all, for a genius. I suppose you couldn't write a book without token women in it in the late 70s, but the main target was still the Male Reader. Balance is therefore provided by the good guys and Amy, the feminine and nurturing ... gorilla. See, this is what an ape can do, modern women should learn a thing or two. Gaah. Don't believe me? Check out all his books and show me an empathetic woman character in the lot. They are either wicked and evil, stupid and evil, ambitious and evil, or misled and evil, or some combination of that. OK, there was one female and not-evil in one book, but that was the book which was anti-environmentalist, so she's misled by the author at least. The one saving grace is that Crichton novel women are not delicate darlings and can trek in jungles as well as the next person. I shall next read a Michael Crichton book only when I'm feeling a lot more masochistic and anti-woman. Though hey, a fast-paced book, more credible than the Hollywood scientists' "the alien's blood is composed of molecular acid" withal. Read it for the thrills, but beware the science or social commentary. Tess Gerritsen says in the introduction to one of her novels that she started writing romances with some mystery, and then moved to mysteries with a bit of romance. This is one of the transition books, heavier on the mystery. Body Double starts with Dr Maura Isles returning from a trip to a forensic conference in Paris to find the police camped at her doorstep. Everyone acts as if they are seeing a ghost. She finds there is a dead woman in a car near her house, who looks just like her. Eeeee. OK, no eeee, you knew that from the back cover. Things get creepier. The dead woman has been shot. She only has a six-month history, nobody can find a trace of her before that. And then her DNA turns out to match. Maura, being adopted, starts on a quest to find out more about who her twin was, why she died, and who her biological parents were. OK, diversion: she has a permanent love interest in a Catholic priest she fancies. (Why do Catholics have celibate priests, and why do Catholic women find them irresistible? It's a gaaah! moment, every time I run across it in any book.) Fortunately, the detective who was helping her sister is a possible romantic interest, having recently separated from his wife, except that his impossible teen daughter turns up at inopportune moments. Maura's main help in resolving the clues, though, comes from Detective Jane Rizzoli, who, despite being 8-months-pregnant and incapable of kicking in doors anymore, unearths a bunch of true and ghastly crimes, all linked with the very first one which we get to know about way back in the prologue. The story is as much about Maura wondering what her genetic heritage has made of her as the pair solving a set of very creepy crimes and tracking down the criminal(s). We meet en route, an obsessive executive, a monster-seeking psychologist, and an upset forensic pathologist, a not-upset forensic ditto (with an Indian name, to boot). This was a reasonably well-written thriller, except for the aforesaid gaaah! moment. I'll check out a couple more by T Gerritsen before coming to a less wishy-washy conclusion. Stay tuned. In the meantime, this is ample for a lazy Sunday, and though it has awfully creepy crimes and motivations for the crimes, it's not an off-putting adrenaline creep-out. 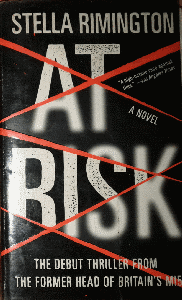 Fortunately, T Gerritsen is not as graphic as Patricia Cornwell or James Patterson. I might well be reading Gerritsens long after my Cornwells and Pattersons have mouldered due to lack of rereads since my middle-aged body can't stand the adrenaline jolts any more. Oh, and why are female characters almost always referred to by their first names, and male ones by their last ones? Fortunately, while Dr Isles gets called Maura mostly, the detective gets called Rizzoli. Balance of sorts. You know all about Percy Jackson, the demi-god son of a woman in New York and the Greek god Poseidon. Oh, you don't? Summary, then. Rick Riordan wrote a whole set of six best-selling books about Percy Jackson, the dyslexic teen with ADHD who finds out one day that he's a demi-god and his best friend is a satyr who's been sent out into the world to protect him from monsters. These monsters have plagued Percy's life since his early teens, and made him shift from school to school as their depredations destroy buildings and worse. Now, Percy finds he has super-powers, and a Quest. Or six. He makes friends with other demi-gods in Camp Half-Blood where they grow up in relative safety, looked after by centaurs and a grumpy god, Mr D, the god of wine, who takes a dislike to our hero and insists on mangling his name at every opportunity. After saving assorted gods, their property, their kids, and even Olympus itself (which is these days parked over the Empire State Building, the Greek gods having moved to the USA without having to undergo immigration checks), Percy looks forward to the possibility of a relatively normal life with Annabeth, the daughter of [spoiler delete]. As in the previous books, the pace is relentless, the dialogues are teen American (as crackly good as the dialogues by James Patterson, dude), the super powers are awesome, and the number of secrets kept between the three main characters is bewildering. You can never predict what new monster, creature, creation, or thing is going to help or hinder them. Riordan's imagination runs through new monsters and concepts like no other author I've come across except perhaps Larry Niven or Douglas Adams. Sure, many authors come up with cool stuff, and JK Rowling is no slouch either, in inventing crazy stuff that teens of all ages lap up eagerly. But the only ones to come up with so many new and crazy things in each book are Niven (the Emperor of new stuff), and Riordan. Jason completes his quest--oh, you guessed that, did you?--and we get a teeny hint of where Percy might be. But why hide the facts? You can read the salient points off the back cover of The Son of Neptune yourself. Percy, too, has lost his memory, and we find him in the beginning of the second book at a camp for demi-gods, except, you guessed it, this camp is for the kids of Roman gods. The Romans picked up many gods from the Greeks, but their versions were usually different, sometimes just a bit, sometimes widely. Percy makes friends at the camp, and gets picked up by a couple of hitherto-loser kids to join them in--you're such a good guesser!--a Quest. The same dread Power that did the villainy in the previous book is still around. The magic stays right there till the very end. This is another series that is going to be a best-selling series, because not only the resident teen, but the parent of the teen are going to be gulping these down by the volume. Read, read. You will enjoy them. There's steam-punk stuff in The Lost Hero, too, in case you need more motivation. Anthony Horowitz writes funny thrillers, thrilling funny books and horror stories with equal facility. He does this for teens. For adults, he writes for TV. Personally, I think he enjoys the books for teens more. Or maybe I'm just projecting my own sentiments on the writing, since, to the best of my knowledge, I've never seen any of the TV series he writes for. To start with, Three of Diamonds. This brings together three of the Diamond Brothers Defective (sic) Agency stories. Nick Diamond, a teen boy, has the most stupid elder brother ever. Tim Diamond fancies himself a detective, with groan-worthily hilarious results. The whole thing from one end to the other is a gag-fest, with a veneer of detectiving as well. It's beautifully done, so that you have a mystery, a logical progress to the solution, and the most insane dialogues and action sequences to take you from one end to the other. Tim reached into his pocket and took out his camera. You have to tell Tim, preferably in short, simple words. “It's on the top floor of the hotel!” Tim exclaimed. “Not the room!” Bastille swore and choked on his cigarette. Sorry, I keep laughing over the paragraphs, wherever the book opens. Anyhow, Nick manages to solve the mystery, and Tim remains convinced he (Tim) is the greatest of detectives. The Blurred Man (yes, Horowitz loves his puns, even though most of the kids who read his books will never have read the originals of the punny titles) has an American who hires the Diamonds to find out what happened to his good friend Lenny Smile, who runs a charity called Dream Time, to which the American novelist has given two million dollars in donations. Just before he was to have met Smile and found out what wonderful work the charity has done, Smile is run over by a roadroller. Why? (Ahem). I am not going to give you a sample of how Tim interrogates the roadroller driver. I don't like to mistype so many words because I'm laughing too hard. Anyway, they solve that one, too. Finally, there is I Know What you did Last Wednesday, in which Tim is invited by his millionaire classmate to visit him on an island, along with a bunch of other classmates. Except that they all start getting murdered one by one. You've seen this in a movie, right? And read the Agatha Christie book of the same premise, right? But you cannot beat Tim Diamond at it. Fortunately, Nick insists on going with him, and Tim comes out alive in the end. Not before you find he topped his school in embroidery. Yes, amazing that Tim could actually do something well, isn't it? Okay, and then I picked up Horowitz Horror 1, which is not funny in the slightest. I checked. A bit of gallows humour once in a while. This is the guy who created an explosive bubble-gum for Alex Rider called Bubble-o seven? Yup. Horowitz writes terrific horror. Just in case you think horror for younger readers is less horrifying than that for adults, well, it's not. It's just as horrifying, if not more, considering that many of the protagonists are kids. There's Bath Night, a story of a haunted bathtub. Killer Camera kills everything it's used to take a picture of. You don't want to know what the last picture in the story was of. Light Moves is about a kid who gets a haunted computer which can predict horse races, and the consequences of greed. The Night Bus is closer to the conventional kids' horror story, but creepy in its own way. Harriet's Horrible Dream is worthy of George RR Martin or Orson Scott Card, and so horrible I'm skipping onwards. Scared is about the city-kid bully in the country, and reminds me, strangely enough, of Ray Bradbury stories. In A Career in Computer Games, Horowitz tries to make the protagonist as unsympathetic as possible so that we don't mind what happens. Yet, in the end, I felt sorry for the wretch, for whom, let me say, I had no plans to have any sympathy whatsoever. The Man with the Yellow Face has supernatural horror in it, rather Victorian in ambience. The Monkey's Ear is the only story in which Horowitz's inner punster leaks out a bit, and it's a fair tribute to that original of horror stories, The Monkey's Paw. TL;DR – read Horowitz's books, and don't worry about your chronological age. Horowitz is that worthy YA writer: he never condescends to his reader, and that's what makes his stories so enthralling. 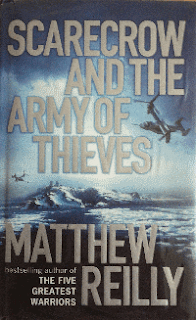 Frederick Forsyth has been writing bestsellers since around the time I learned to read. The first of these was the paradigmatic The Jackal. The Cobra is possibly the first time he has reused characters, so in a way, it's a sequel to The Avenger. For reasons that I cannot tell you for fear of spoilers, it is, let me say, unlikely that there will be another sequel in the series. In The Avenger, Cal Dexter, a small-town lawyer, is actually a bounty hunter, who is out hunting an evil villain, whom Paul Devereux, a spook, is trying to protect, so that he (Paul) can use him (evil villain) to get at an even bigger villain. In the sequel, Devereux is tasked by the President of the USA to finish the cocaine business once and for all. Surprisingly to everyone except himself, he decides to pull in Cal Dexter as his right hand man. F Forsyth's books are nothing if not meticulously researched. As the story proceeds towards its breathtakingly unexpected end, you can't but help being drawn in, believing that, yes, in fact the cocaine trade can be stamped out like this, and the people in the story are doing just that. It's a bit of a shame to come to the end and realise that cocaine is coming along just fine after all. There are writers like James Patterson and Patricia Cornwell who take you down to the grisly details of what the villains do. Forsyth is more sparing, and gives only enough to let you understand the characters, but stops just short of enough to send you running for the toilet. (It's going to be a long time before I read another J Patterson book for adults, or one by P Cornwell. I'm getting more squeamish the older I get). Altogether, a fairly satisfying book and a vicarious look at what it could take to get the cocaine monkey off the addicts' backs. If only real life was as simple as a complex book plot. Worth a read. Given that this was probably my third reread, you can believe I'm putting my eyeballs where my mouth is (uh, no, unfortunate metaphor, but you get the idea). And, yes, you should read The Avenger, too, preferably before you read this one. 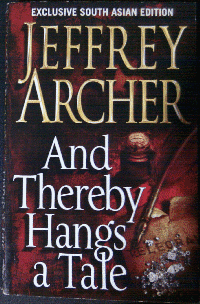 Jeffery Archer is quite possibly one of the best short story writers in the world. Even better than the hoary old classic short story writers, O Henry and Saki. And at least the most famous writing in English. This collection contains 15 stories, 10 of them 'based on true incidents'. All the stories have the trademark Archer twist. His clever writing hides the end from us, and leaves us delighted at the sudden new direction in the very last sentence. Well, not in all the stories, but most of them. And if you didn't believe truth is stranger than fiction, the very last story is apparently based in New Delhi, and has an actual prince. One rich enough, despite 'the family wealth had been steadily eroding over the years', to fly down to San Francisco every weekend for a year. Hah, now that's tough to believe. I've only dipped into the Dresden Files series. I've read the first one, then Summer Knight, and now Changes. Edit: Mike Martinez says that I should put in major spoiler alerts. I didn't think I'd put in any spoilers, but just in case. Be warned. Some things below may be spoilers, probably the partial list of characters, or the duel which Dresden won in a previous book (oh, come on, he has to win them all; he's the hero). So, to start with, 10 bonus points for the fact that I don't feel like I've lost my way somewhere in between and need to trudge through all the intervening books in sequence. You have to admire a writer who can avoid prior plot summaries along the way, have loyal readers instantly identify characters from before, yet not turn off new readers who plop in for a look-see in mid-stream. 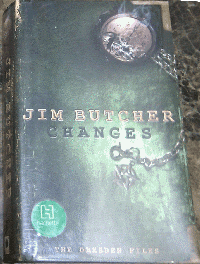 Changes is the latest in the series on wizard Harry Dresden, who solves supernatural mysteries for the local police force. Oh, wait, not any more. Now he solves supernatural mysteries for supernatural types. His erstwhile flame, Susan, is back on page one, telling him the Red Court of horrible vampires (implying there are less horrible ones, and we meet at least two in this book) has kidnapped their daughter. The one she hadn't bothered to tell him about these past 8 years and counting. Curses! Susan and her companion Martin (both half-turned vampires) are part of an underground fighting the Red Court in South America. (Apparently all the woes of the continent are due to these bloodsuckers. Gosh. That makes perfect sense, doesn't it? Doesn't it? OK, I wasn't impressed either; it only made me chuckle once out of half my mouth). And the Red Court has sent the evil villain, Duchess Arianna Ortega, the widow of the ex-villain (dead now) Duke Ortega, killed by Dresden in a previous book, and kid-napper of the girl, as the ambassador to the White Council of Wizards. Who do not take kindly to Dresden's attempt to challenge her to a duel. And he can't tell them why, as then anyone can use the kid against him. Dresden then rounds up support in other places, and realises that his best bet is to take in all his friends, but then since all of them will likely die, that means he's killing all his friends. Fortunately, there is more than one way out of this dilemma. He takes one of them, and his friends the other (smack him upside his head and say we're coming along, like it or not, stupid!). Of course there is a happy ending of sorts, or Jim Butcher would not be releasing another book this coming October. "You aren't the boss of me." [That's Dresden's apprentice]. I could all but taste the pride she felt at making her talents useful to my cause. "The hell I'm not," I told her. "Do it or I dock you a year's pay." "You know you don't pay me anything, right?" "Curses," I said. "Foiled again." You also get exotic locations. Chichen Itza. Edinburgh. What? Edinburgh is exotic to me. Chicago. Ok, stop giggling. What causes facepalm? Long series tend to accumulate characters, particularly ones the author doesn't feel like killing off from time to time. Harry Potter had so many characters by the last book that you needed some 30 extra pages just to fit their names in. The Dresden series is going that way, too. See which ones you recognise: Dresden, Susan Rodriguez, Martin, Molly, Margaret Angelica (aka Mom), Duke Ortega, Duchess Ortega, White Council, Red Court, Grey Council, Black Council, Karrin Murphy, Wizard MacFee, Wizard Cristos, Carlos Ramirez, Anastasia Luccio, Arthur Langtry, Wizard McCoy, Bob the Skull, the doggy Mouse, Rudolph the IA cop, and le chat. And that's only from the first 10 chapters. There's a bro, a Knight of the Cross, tiny faeries, major bad faeries including Mab, and Dresden's faerie godmother, who is promoted in this book by Molly: "Spooky death Sidhe lady," Molly said. "Now upgraded to spooky, crazy death Sidhe lady." "Bless you, child. You have such potential. We should talk when this is over." Dresden gets at least two upgrades himself in this book. One by deducing something and asking for it, the other by a Deal with [spoiler deleted]. Plenty of sorcery, good guys vs. monsters, and other assorted wizardly complications that the Dresden Files reader knows and expects. Jim Butcher maintains his standards in this one. But he needs to do something about the population explosion. You already need a fisheye lens for the cast photo at the end of the book. One sad bullet at the last page doesn't begin to make a dent. I knew when I picked it up that it would probably be lightweight SF. You've seen this trope many times before. If you've seen Aliens vs. Predator, a terrible movie, you've seen the 'hideous creatures under the ice' trope. And perhaps this suffers from comparison with the last book I read with the trope, Gridlinked (see earlier posts), which, too, had a hideous murderous thing under the ice. But it's not steampunk, alien-punk or far future folderol. This is near future stuff. But this book has another trope, too, and I wanted to see how the two meshed. The hero, Capt Alex Hunter, has become a superman. Nope, no radioactive spiders, just a bullet into a part of the brain which gets superactivated in his case. He can run faster, see further, in the dark, hear better, be stronger, cleverer, you name it. Err, you saw this in the James Bond movie The World Is Not Enough. Except that Hunter is not immune to pain. There is also Dr Aimee Weir, a petrobiologist, who spends the first few chapters slowly falling in love and sharing gazes across the room. For some reason, she can also do instant dissections and tell you all about the Creature under the scalpel. There is the creepy Dr Silex of the lax ethical codes and roving hands. And the monster under the ice. OK, I'm not giving away any spoilers about how this monster, a prototype kraken, differs from other trope-y monsters. It's different. Trust me. Whatever is not a trope will not suffer spoilers. OK, hint, Arthur C Clarke did something similar, but not similar enough to make it a trope. Of course, there are ancient pre-Mayan Altanteans, nonono, they are Aztlans, using granite from Aswan to build a huge city in the Antarctic (facepalm). Except that they built it about 10000 years ago when Antarctica was warm and green. Let me put in the comma: 10,000 years ago. And then it sank under the ice. Anyhow, with the help of the hotshot climber Monica Jennings and the smitten-by-Monica Dr Matt Kerns, the archaeologist, the whole lot goes down into the ominous cave, in the wake of the previous expedition, of which they have a few bits and pieces left, which in turn was off to rescue a billionaire's planeload of hangers-on, of which pieces, ditto. And presently they are attacked both by Russians and the creature. The Russians have been sent by their Energy Minister, who is terrified of the ex-KGB President, and sends in their elite killer unit just in case the liquid under the cave is petroleum, which mother Russian will naturally keep to herself, but the gracious Americans by contrast will either keep safe for the future or share generously. Right. This minister later on turns out to like teen prostitutes and gets assassinated. What's with this penchant of Americans to demonise Russian villains, anyway? I asked this before, and I ask it again. Russia is a democracy and has checks and balances. OK, OK, I'm grateful the Americans don't demonise Indian villains. I'd stop reading their fiction, most likely. The underground thingy turns out to be a lake with beaches populated by enough new forms of vicious life to give Pellucidar a hat-tip. As with any Creature movie, the cast gets killed off one by one, leaving very few to be rescued at the end, and as a going-away prize, knocks off a few of the rescuers as well. I'll leave you to guess who gets killed. 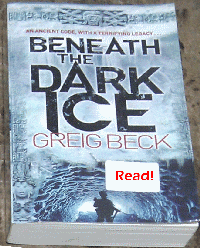 Is Greig Beck the new George RR Martin (everyone dies!) or more in the Hollywood tradition? Read it on a tired Sunday when you really have no energy for more than some light, fluffy entertainment, and the TV or DVD player are on the blink. It will not make you strain your brain, hough you will learn how blue ice differs from other ice, and what a halocline is. It's what we in India call 'a time-pass'. But I picked it over serious literature. Therefore you safely conclude my last Sunday was not particularly energetic. This is a neat little anthology comprising "short stories from the Golden Age of Science Fiction" by Jaico Publishing House, and cost a mere Rs 225 in 2004. It has five stories, and I'll take them up one by one. 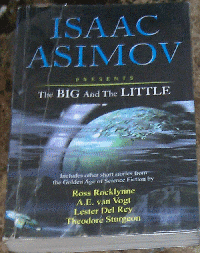 The Big and the Little by I Asimov is part of the Foundation series, and was originally published, like the rest of the stories collected in novel-sized volumes, as a separate novelette in the series. This story brings to you Hober Mallow, a trader, and the next Seldon crisis facing the Foundation. Having used religion and magic tricks to awe the remnants of the galactic empire nearest their own base, the Foundation has atrophied into a dogmatic insistence that only trade strongly linked to missionary activity (in which the non-Foundation people are kept as ignorant as possible) is the key to their safety and stability. What happens when this collides head-on with a trader's natural instinct? What if the minor princelings around actually have atomic energy? (When this story was written, atomic technology was the be-end and all-end of scientific endeavour, and the computers are quaint at best). But it's human nature which brings forth the solution. This particular story has relatively fewer anachronisms, and is a fun read (if you ignore the 'princess', a caricatured character if there ever was one). However, you do need to know what the Foundation is, and what a Seldon crisis is. You won't get that here. Time Wants a Skeleton by R Rocklynne has a different set of anachronisms. Since this is a less well-known story compared to the others, here's a summary. Lt Tony Crow fails to dodge asteroid 1007 and crashes on it. (It's all the fatigue from the desperate need for dodging close-spaced hurtling asteroids that gets everyone dead, you know). Fortunately for him, the villains are also right there, and he decides to arrest them as well as get a ride home from this bit of space rock where no human had ever come. Except that there is a skeleton lying in a cave, and Crow knows it predates humanity as well as being a human skeleton. It wears a distinctive ring. Anyway, during the ensuing shoot-up, they all manage to destroy the villains' spacecraft. Except that a scientific expedition promptly lands (the coincidence is exclaimed upon), and rescues the lot. So they fire up the H-H drive that runs on gravitons, of which there are "1846 in a proton and 1 in an electron", which explains weight, forget those H bosons we are nattering on about. "A Wittenberg disrupter tears atoms apart. The free electrons are shunted off into accumulators... The protons go into the proton analyzer where the gravitons are ripped out of them and stored in a special type of spherical field. When we want to move the ship, the gravitons are released... The natural place for a graviton is in a proton. They rush for the protons -- which are already saturated... Gravitons are unable to remain free in three-dimensional space. They escape along the timeline, into the past. The reaction contracts the atoms in the ship... and shoves it forward along the opposite time line-- into the future and forward in space. In the apparent space of a second, therefore, the ship can travel thousands of miles, with no acceleration effects." Of course, the gravitons cannot travel to the future, totally laughable, but in the story, they do, hurling the whole lot into the past onto the planet that broke up to form the asteroids. Just before it's going to be smashed. Ok, and the ring belongs to one of the outlaws. But he doesn't want to be the skeleton of the future. Neither does anyone else. And now it's clear that someone has to be the skeleton, left in the cave when the planet blows up. This leads to a murderous round of passing-the-parcel while everyone tries to fix the ship before the planet blows up. There is, naturally, air, water, streams, plants, and stuff. Anyhow, no spoilers. As you expect, they return to the present. The hero and the heroine (the professor has a beautiful daughter) ought to be safe, eh? After all, it's Christmas. Despite a few really dated scenes, it's a fresh little piece after all. What can I say about The Weapons Shop? It's a classic which everyone has probably read. A loyal subject of the Empress is horrified to find the evil Weapons Shop people have set up in his village and he will have none of it. Except the Weapons Shop ("The right to bear weapons is the right to be free") has the bestest technology, and can not only read minds but right all wrongs. And our man is much wronged till he realises that the WS guys are the good guys and the Empress is the real evil. He ends up buying his weapon and holding his head high, admired by all and sundry (they are all secret admirers of the WS after all). I imagine this story exemplifies much of the American approach to gun control, and has probably directly influenced millions of young minds over the years. About the quality of writing: it's actually quite appalling the amount of mind-control AE V Vogt has over us mere-mortal readers! Nerves has thoroughly dated in its technology. Atomics again! This time artificial elements that are produced in reactors. Not the mingy power generators that the real future of the story fiddles around with, oh no, these produce transuranics and other wonderful isotopes. One of them takes an unexpected reaction path and decays into Isotope R, which is bound to decay in an unknown time into Mahler's Isotope, with complete breakdown in a billionth of a second, and goodbye continental USA, or at the least 50 miles of city. Dr Ferrell, the famous peerless surgeon is now a company doctor with National Atomics Products Co., Inc. He is training new doctor Jenkins. Together they face the sudden parade of injured and dead people resulting from the catastrophe. Bring in Dr Brown, Dr Jenkin's wife, a 'nursing doctor', Palmer the factory manager (in those days, it was acceptable for a factory manager to be a kind of hero), Hokusai and Jorgensen, the scientist with untimely appendicitis, and the technologist who alone can suggest what is to be done. Except that Jorgensen is one of those rescued, and near death. All now depends on Jenkins, who turns out to be the atomics-trained stepson of Kahler, the long-dead wizard of all things atomic. And Jenkins fears he is going to crack, with half the continent at stake. This story still has power due to the human angle. And given the recent scares in Fukushima, perhaps not so dated after all, in another way. Last but not the least, the classic Killdozer! by Theodore Sturgeon. An ancient race wiped out all life using, among others, malevolent negatively charged gaseous entities inimical to all life (phew!). One of the more primitive of these was caught and stored in a neutronium box (warning: dated! Neutronium is too dense to do anything but sink to the centre of the Earth in this timeframe) and tossed around on magma until it finally ended up on an island where a team is sent to build an airfield. The high-tech bulldozer catches an edge of the grey stone in an ancient temple (ha!) and tears it open, releasing the entity--into the bulldozer. Which then proceeds to try and kill everyone on the island (warning: dated! Why only kill the humans?) A crackerjack suspense/adventure story, the original for the trope of the machine with a mind of its own. This and his other story Slow Sculpture have firmly fixed Theodore Sturgeon in my mind as one of the best sci fi authors ever. A good, if highly dated, collection. Still enjoyable. Probably nudging 4 stars out of 5.